I know i'm late but for whatever reason this morning in particular I just had the conviction to speak on Barbara Ehrenreich's book Nickel and Dimed even though I read it like 6 months ago. So the upshot of the book is that poor people really have it a lot harder than you would think. Generally speaking working just any job isn't enough to survive as Barbara documents in her journey through minimum wage life. For any of us non-privileged goyim, commoners we already discovered this at about 18-19 years old. Barbara thoroughly analyzes this at like 40-50 something. But nevertheless I would just like to point out the few things that Barbara refused to put herself through during her observation such as subjecting herself to a diet based on her earnings as a minimum wage worker, a more realistic room share living situation, and taking public transportation. These three omissions saved Barbara significant trauma but severely tainted the authenticity of her experience. To her credit I am extremely grateful that she did the book in general, and particularly satisfied that she took the time to mention the poor diets of the maids she worked with and the ridiculous behavior of the customers that used the cleaning service. 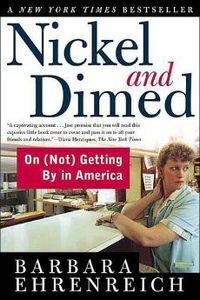 I am sure Nickel and Dimed was enlightening to many, however, excluding herself from the inconvenience of diet, housing, and transport restrictions that people living under the minimum wage regime suffer totally changed her experience from being poor incarnate to kind of looming near the poor and guessing what they were going through while translating their complaints. The reality of diet restrictions that poor people face are pretty much universally looked over. No one cares to ever mention this. This is mostly because we live in a society that eats nutrient deficient food. Most people figure if you can't see your ribs that you're well fed. This couldn't be further from the truth. Any good nutritionist will tell you that you can even be overweight and still be malnourished. Malnutrition is not just a physical issue as far as getting skinny or fat. Malnutrition will affect all aspects of your life, including your energy levels, and decision making. Your energy levels a.k.a enthusiasm especially at work will affect your relationship with your peers and boss which will affect how far you go or if you go at all. Your decision making and general motivation will affect every aspect of your life. If you are on the verge of fainting the entire day there is no way you can make decisions or plans that will benefit you in the long term. This is the effect of not having enough nutrients...we haven't even discussed what adding other harmful substances to your body will do. The main substances being abused by people living in poverty in America are SUGAR and SALT! Most poor people are eating a diet of mainly sugar and salt and white flour carbs. Poor people are consuming these harmful additives in the form of cheaper foods, and junk/fast foods and snacks. This diet will weaken the immune system which will allow them to succumb to common cold, headaches, aches and pains etc. the type that are not life threatening until they culminate but will leave them out of work for days here and there without pay and will negatively affect their moods which will damage their relationships with all of those around them, which will increase stress in their lives because of added and unnecessary friction in relationships. This will result from small but continuous abusive nuances like snapping or being curt because they are in pain, not well rested, or simply just cannot think straight because of irritation from hunger or from the side effects of consuming too much sugar or enduring a salt headache, stomach cramping or indigestion that they're suffering through while trying to juggle all of their other strenuous (usually physical labor) responsibilities. Housing of the poor is a constant underrated issue. We tend to notice that along with poor neighborhoods come high crime rates. No one usually cares to make the connection between these two facts other than to assume all poor people are criminals and that's just the way nature designed it. From a sociological perspective this is the case because of low income leading to crowded living situations that require cooperation with others. The constant interaction with roommates, and neighbors causes annoyances and relationship friction that would otherwise be avoided if people were not required to share living spaces such as apartments with common areas or room shares. This is what most disputes stem from e.g. removing someone else's clothes from the laundry machine before they get back, leaving common areas untidy, unreplenished items such as groceries, cleaning supplies, shared bathrooms especially if there is only one shower that would require cooperation and adherence to time slots to make sure everyone leaves home on time, noise disputes involving loud music or t.v., unwelcome house guests, access to misuse of another persons belongings without permission etc. Horrible roommates will cause stress in anyone's life. Especially when you are living with roommates who are otherwise strangers. This new, strange, threatening, and very intimate environment causes heightened fear and stress. This will affect how someone is able to sleep and their overall mood. If they are having a dispute/conflict with said roommate the stress and fears become even worse. Often times such disputes lead to financial set backs in the form of lost security deposits sudden change of address, sabotage of property including work clothes and equipment which could endanger ones employment and further complicate an already bad situation. Transportation is not everything not having it is. Most reasonable people would agree without having to experience it first hand that having to travel one and a half hours via public transit complete with a twenty-five to thirty minute walk to your final destination is not fun. What if you had to endure an eight hour shift that requires you to be on your feet the entire time, in addition to having problems with roommates at home, on top of hunger pain, headaches from moderate dehydration, pain from various heath issues you cannot afford to treat, stress at work, stress all around because of your financial collapse, lack of adequate sleep, and then add an additional one and a half hours via public transit complete with a twenty-five to thirty minute walk to your final destination EACH WAY! Yea... most of us couldn't imagine it. In fact if put to the test your average middle class American would crumple under the pressure in a matter of days. This is a torturous scenario to imagine without even factoring in the reality that most people enduring this everyday are also likely to experience domestic violence and usually have to juggle child care. Its an absurd and sisyphean ciclical hell ride that upwards of 75 million Americans face each day. When Barbara Ehrenreich chose to exclude from her experience the Diet, housing, and transportation realities of the poor she missed an entire book's worth of information on the emotional, psychological and physical harm that people living on minimum wage suffer through everyday.